The Cablexa NIC-9802BF-2SFP10G 10G Server Adapters NIC with SFP+ connectivity are the most flexible and scalable Ethernet adapters for todays demanding data center environments. Data center networks are being pushed to their limits. The escalating deployments of servers with multi-core processors and demanding applications such as High Performance Computing (HPC), database clusters, and video-on-demand are driving the need for 10 Gigabit connections. Customers require flexible and scalable I/O solutions to meet the rigorous requirements of running mission-critical applications in virtualized and unified storage environments. The explosive growth in virtualization is leading to an increasing demand for network performance. With more Virtual Machines (VMs) running on each multi-core server, networking traffic is dramatically increased with each VM competing for available I/O bandwidth. Intels family of Cablexa NIC-9802BF-2SFP10G 10G Server Adapters NIC addresses networking bottlenecks in virtualized environments. These adapters enable network-intensive applications to achieve the performance expected in a virtualized environment. 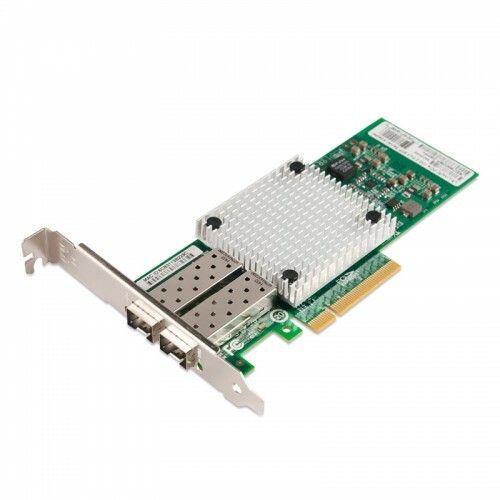 The Cablexa 10G NIC-9802BF-2SFP10G server adapter NIC provides the best networking performance available in the industry, whether the physical port is configured in an emulation mode using the virtual switch in the Virtual Machine Monitor (VMM), or is directly assigned to a virtual machine. In the emulation mode, Intels I/O technology, Virtual Machine Device queues1 (VMDq) optimizes network performance by offloading data sorting and copying from the software Virtual Switch in the VMM to the Intel Ethernet 82599 10 Gigabit Controller. This configuration is best suited for a large number of VMs running standard applica- tions that have limited bandwidth and latency requirements. For mission-critical applications, where dedicated I/O is required for maximum network performance, users can assign a dedicated virtual adapter port to a VM. Using the PCI-SIG SR-IOV capability on an Cablexa NIC-9802BF-2SFP10G 10G server adapter NIC provides direct VM connectivity and data protection across VMs. SR-IOV technology allows the data to bypass the software virtual switch and provides near-native performance. It assigns either physical or virtual I/O ports to individual VMs directly. This technology is best suited for applications that demand the highest I/O throughput and lowest latency performance such as database, storage, financial and other applications. PCI-SIG SR-IOV is a mechanism for devices to advertise their ability to be directly assigned to multiple virtual machines. SR-IOV allows for the partitioning of a PCI function into many virtual interfaces for the purpose of sharing the resources of a PCI Express- (PCIe) device in a virtual environment. These virtual interfaces are called Virtual Functions. Each virtual function can support a unique and separate data path for I/O-related functions within the PCI Express hierarchy. Use of SR-IOV with a networking device, for example, allows the bandwidth of a single port (function) to be partitioned into smaller slices that may be allocated to specific VMs, or guests, via a standard interface. The family of Cablexa NIC-9802BF-2SFP10G 10G server adapters NIC lowers your data center total cost of ownership (TCO) by providing the ability to route LAN and SAN traffic over a single fabric. FCoE encapsulates Fiber Channel frames over standard Ethernet networks, enabling Fiber Channel to take advantage of 10 GbE networks while preserving its native protocol. The Cablexa NIC-9802BF-2SFP10G10G server adapter NIC offer FCoE hardware acceleration to provide performance comparable to FC HBAs. The server adapters support Data Center Bridging, also known as Converged Enhanced Ethernet (CEE), which allows customers to configure traffic classes and priorities to deliver a lossless Ethernet fabric. An Intel Ethernet X520 server adapter reduces TCO by eliminating redundant fabrics and saves the cost of expensive FC HBAs and FC switch ports. The server adapters provide complete support for proven native OS and VMM iSCSI initiators as well as iSCSI boot. Historically, CRC32C computation has degraded system performance, but now with the CRC instruction set included in the latest Intel Xeon processors, CRC validation is possible with minimal impact to network throughput while delivering superior data integrity. The family of Cablexa NIC-9802BF-2SFP10G 10G server adapters NIC include a number of advanced features that allow it to provide industry-leading performance and reliability. The adapters support IPsec offload for Microsofts Network Access Protection (NAP), Active Directory,- and future security capabilities in Windows- 7.An Cablexa 10G server adapter allows customers to run a secure network environment without sacrificing performance. PCIe v2.0(5GT/s) support enables customers to take full advan- tage of 10GbE by providing a maximum of 20Gbps bi-directional throughput per port on a single dual port card. Support for technologies such as multiple queues, receive-side scaling, multiple MSI-X vectors, and Low Latency Interrupts allow the Cablexa NIC-9802BF-2SFP10G10G server adapter NIC to provide high-performance, 10 Gigabit connectivity in multi-core server blades. These technolo- gies distribute network processing across multiple CPU cores, improving overall performance.